(Feb. 27, 2017) -- It’s a collaborative musical project that tells the stories of people who call San Antonio and south Texas home. UTSA music professor and composer, Ethan Wickman will debut his cantata, “Ballads of the Borderland”, this week in San Antonio. The cantata highlights issues of identity and family history through the poetry and words of John Phillip Santos, a University Distinguished Scholar in Mestizo Cultural Studies, and Carmen Tafolla, associate professor in the UTSA Department of Bicultural-Bilingual Studies. With the help of a $5,000 Internal Research Awards (INTRA) award from the UTSA Office of the Vice President for Research in 2015, Wickman conducted the research that formed the foundation for the interdisciplinary project. He dug into the archives at the UTSA Institute of Texan Cultures and interviewed San Antonio residents to hear their family histories. 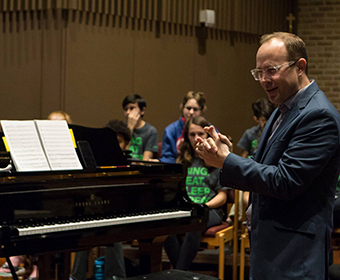 Wickman collaborated with the SOLI Chamber Ensemble, Children’s Chorus of San Antonio, Soloist Tynan Davis and members of the San Antonio Chamber Choir. “I hope listeners leave the performance with greater empathy for the experiences of others, and new insight into how our experiences bind us together in ways that are not always apparent and go deeper than we often acknowledge,” said Wickman. “Ballads of the Borderland” premieres on February 27, 2017 at 7:30 p.m. at St. Mark’s Episcopal Church, 315 E. Pecan St. It will later be performed at the Tobin Center for the Performing Arts on May 6, 2018. Learn more about Ballads of the Borderland. Learn more about Ethan Wickman. Learn more about UTSA Department of Music.